Well, it's been another week of putting out fires around home and work. I took the car in for a simple oil change hoping they'd try and not hard sell me an overpriced air filter, flush job or blinker bulb. No worries there, except that he said our battery needed replacing. Oddly enough they "had a special" running and could get me one for $100.00. Needless to say, I didn't bite. I will cross that bridge soon enough, but I wanted to do a little homework myself before I pulled the trigger. 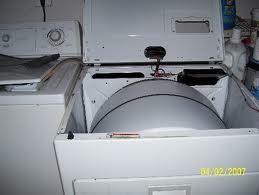 Then, on Monday morning, my wife tells me the dryer had stopped spinning. I "fixed" that problem a couple of years ago when I replaced the belt under the advisement of a friend who said it was fairly straightforward. So when I got home from work, I popped the hood on it and it looked like the belt was OK. I spun the drum a few times, and shimmied (a technical term) the belt to make sure it was moving and then put it back together. Turn it on and no joy. Actually it turned about 3/4 turn and then stopped. Back to disassembling it again. I futzed (another technical term) with the belt and the felt lining around the drum some more and reassembled. Turn it on and success! If I could tell you what I did to fix it the second time, I would. I think I scared it into working, actually. Coarse language will do that to appliances. In the meantime, I've ordered a new belt, because the one that's on there is looking old. Tonight I did an upgrade at work that went about as badly as expected. I was there for 2+ hours trying to figure out what went awry. It was a stupid software thing. Maddening software I deal with. These are just the unexpected things that come across our lives once and a while. It's the self-inflicted pain and agony that I need to stop doing. For instance, the other day, my daughter said that she upgraded her phone's operating system to "Ice Cream Sandwich." She has the same model as mine, so of course I needed to get that too. (Shiny!). Well, when I conducted the upgrade it said something about deleting or overwriting my contacts. For reasons unbeknownst to me I said Yes. (I was thinking, well, I don't know what I was thinking, actually.) At a minimum though I thought I would have them backed up somewhere. Bye bye contacts. Hello clean new phone. I added a few contacts back in, maybe 10 important ones. Needless to say when I added the 10 back in, I researched how to back them up online. I'm beginning to think walky talkies and rotary phones weren't so bad. At least I didn't have to remember a password to use them. And so I'm going to hope tomorrow is a quiet day. Quiet is good.